Comic Authors and Artists, Arcadia Time Lords Cosplay Replicas, 501st Legion, Retro Gaming, Dungeons & Dragons and Board Game Demos, Cosplay Contest, Vendors, Food Trucks, Photo Booth, and Activities for all ages! 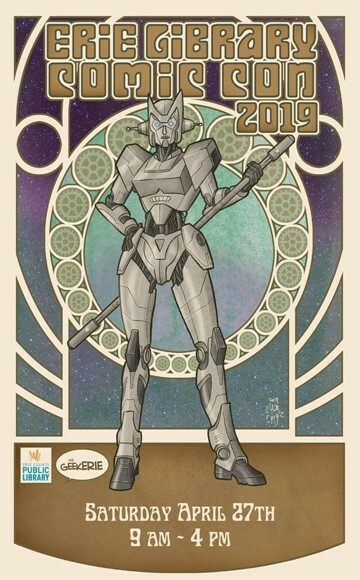 Are you interested in participating in the 2019 Erie Library Comic Con at the Erie County Public Library? We are accepting applications for vendors, artists and workshop presenters. This is the 5th year for this family friendly, free event. It is the largest, FREE gathering of comic book and pop culture fans in the tri-state area. Please complete your application by March 23. Return the completed form by email to teenspace@eriecountypa.gov, or drop off in person at the Blasco Library, 160 East Front Street. After review, we will contact you via email to confirm your participation by March 31st. We hope you will join in the fun!